Stylish and extra comfortable bentwood-style circular rattan armchair with thick white twill cushion. Two available; price for each. Sleek black bobbin-turned style armchair in glossy piano-lacquered finish. Front legs with casters. Thick foam and white twill cushions add comfort. 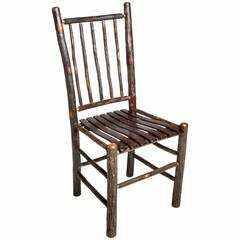 Handcrafted Adirondack hall or dining natural wood chair with spindle chair back and split wood seat. 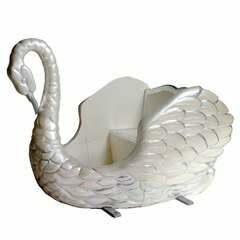 Large swan carousel loveseat of carved hardwood on metal support plate, repainted in antique white finish with silver accents. 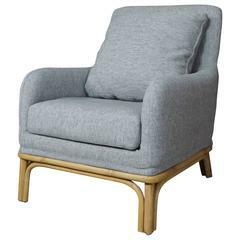 Mid-century rattan armchair with metal base from France. 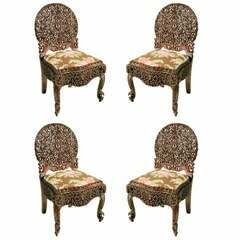 Italian rattan chairs by Bonacina Sculptural shape Set of 4 available, priced per pair. By Seven Seas Rattan Co. 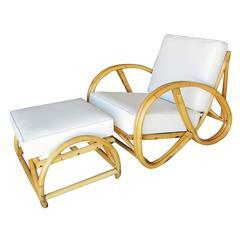 Lounge chair from the 1920s made from steam bent cane and rattan. Good over all condition. Possibly Swedish. st920.